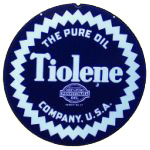 This circular service station sign advertises Tiolene oil. The sign is blue with a zigzag white border around the circumference. 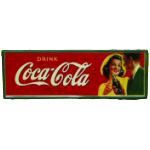 The brand name “Tiolene” appears in the center of the sign. Above, it reads “The pure oil” and “Company. U.S.A.” beneath the Tiolene logo.